It’s wonderful to be able to share books with my children that I enjoyed when I was young. One popular author and illustrator who has truly stood the test of time is Eric Carle. My boys’ love of his perennial favorite, The Very Hungry Caterpillar inspired this fun story time idea. Read on to see how perfectly his popular book pairs with a fun learning activity. 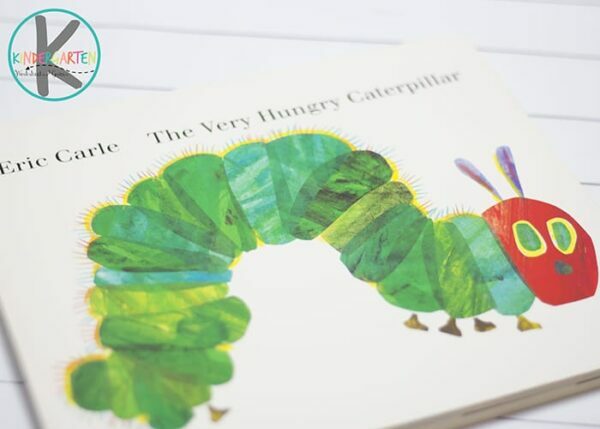 The Very Hungry Caterpillar is arguably one of Eric Carle’s best loved stories. The author and illustrator has been popular for years for bright, colorful illustrative style, and this book is no exception. Kids love the tale of a tiny green caterpillar who spend a solid week eating through a variety of tasty treats. Eventually the little guy is not so little, and spins a cocoon to begin his metamorphosis. Young readers love the vibrant reveal at the end of the story, when the green caterpillar has become a beautiful butterfly. The story is popular for it’s simple, repetitive style. 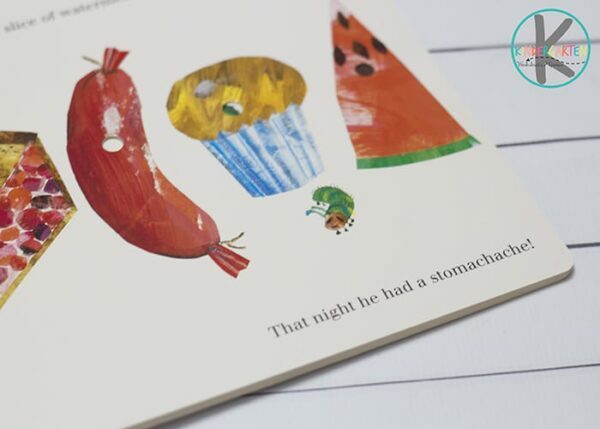 Young readers can easily join in on choruses of ‘but he was still hungry!’ The story follows a week in the life of the little caterpillar, listing the days of the week in progression, making it a great choice for discussions of days and sequencing. The little fellow eats through 1 apple, 2 pears, and so on, so the book lends itself well to counting and math skills. Finally, the life cycle of a caterpillar is presented in a simple, concise way, making the book a wonderful choice for early science discussions about life cycles and metamorphosis. As I mentioned above, The Very Hungry Caterpillar is a wonderful choice as inspiration for math practice. Since 100 charts are such a popular way to develop strong number sense, I created 2 to compliment the story. 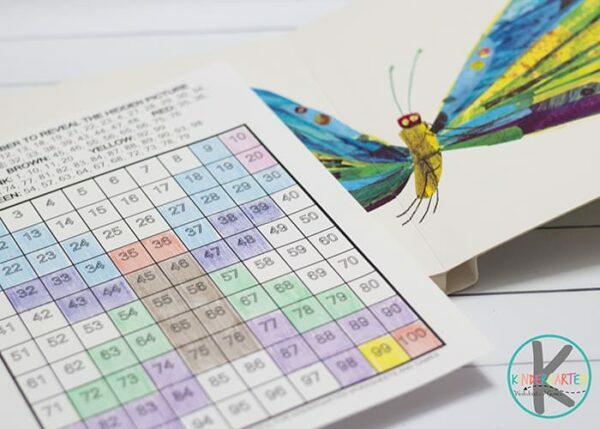 Kids will enjoy coloring bright, vibrant renditions of both the hungry little caterpillar and the beautiful butterfly while practicing number recognition independently. 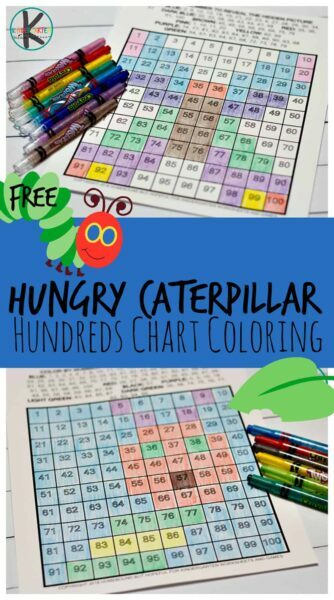 Free printable Caterpillar 100 Chart and Butterfly 100 Chart. 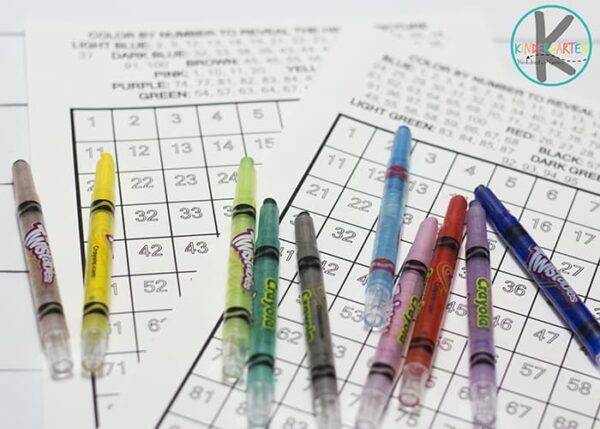 Colored pencils, crayons or markers. 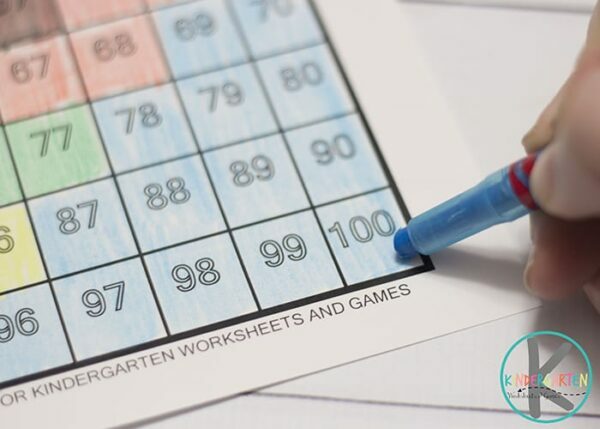 Print a copy of both 100 Charts for each child. 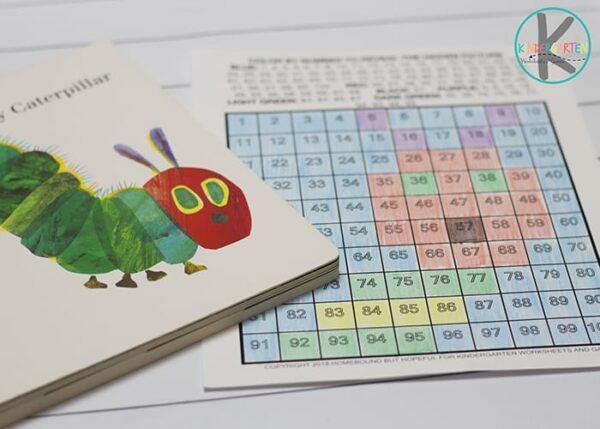 Encourage child to color by number according to the top of each page to reveal the hidden images of the hungry caterpillar and the beautiful butterfly. Enjoy this fun, relaxing art activity after story time. It’s a perfect pairing of colorful creativity and important math concepts.